I like EmEditor, it’s a really good text editor, especially in processing Unicode & Multibye characters, but I think the default color themes it provides still can be enhanced. 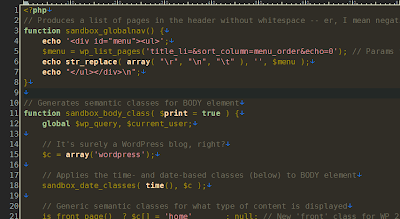 I like low-contrast and dark background color themes such as the Minimal theme in textmate and the Zenburn theme in vim (see also here), so I put them together and made one for EmEditor, the “MinimalZen”. Hope someone will like it, and thanks for the great work of EmEditor’s developer Yutaka, Zenburn’s author Jani Nurminen, and Minimal’s author Minimal Design. Great theme! Does anybody know name of the font used in this example? 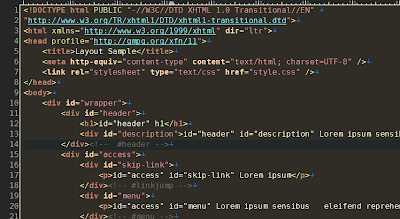 I updated this theme, to fit the recently released EmEditor version 9, if someone encountered the same problem of jadde29, you can download the new theme from http://www.box.net/shared/yffuyr1j6n. Would you please add these colors? Also, is it possible for me to add the MinimalZen theme to EmEditor as one of the installed themes?